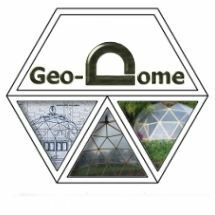 Invented by R.Buckminster fuller in the late 1940s geodesic domes are one of the most efficient structures known to man, often thought of as complex or expensive to build, here at Geo-dome we can show you just how simple, cost effective and efficient geodesic dome structures can be. Most of the ideas for new kits start out in the design/plans section of the site so if you have an idea for a dome let us know and we'll draw something up for you. We have CAD design, photo realistic 3D rendering and graphic art software so we can make your ideas truly come to life. 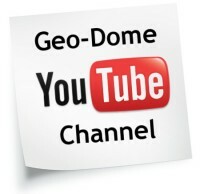 Below is a video showing just a few of the domes built using the geo-dome plans. If your feeling a bit more adventurous you could try building your own geodesic dome from scratch, we have plenty of articles to show you how. Start with the dome calculation tools we have a 2v calculation tool and a 3v calculation tool, try building a Paper model or making your own geodesic dome hubs. 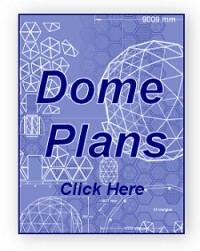 If you need more detailed help or advice about dome building try the forum. New for 2016, sketchup video tutorials showing you how to draw geodesic and other domes from scratch, it's actually not that difficult. I'm no longer building the kits, well at least for this year. Demand was so high that I couldn't keep up without having some sort of nervous breakdown. So for this year (2016) I'm going to concentrate on new designs, plans and also updating the website. I have a bunch of new things planned for the site and will be doing some geometric based building designs other than domes, the video below shows a new pyramid design I have just finished. Some of the technical terms used in geodesic geometry can be difficult to grasp, especially if you are a newby, well don't worry because the new wiki knowledge base will explain in simple terms many of the principals and technical terminology used in geodesics, for example: every wondered what a Deltiodal Hexecontahedron is, or a Johnson Solid. the database contains simple explanations for beginners like Geodesic dome frequency, with links to further resources or more complex geometric concepts like Zonohedron. The wiki is under construction at the moment so there will be much more info added over the next few months.